Eyes are a very delicate and the essential part of the body. It is very easy to destroy or compromise your eyesight by simply being careless about eye strain and good healthy eye habits. 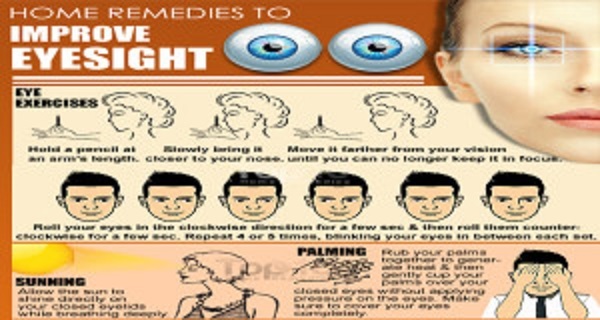 This article will teach you some methods you can use to preserve and improve your eyesight. There are many factors which can lead to weak eyesight, including poor nutrition, genetics, aging and excessive strain. Also, cataracts, macular degeneration and optic neuropathy can cause problems with your eyesight. Besides glass, lenses and surgery, there are natural remedies which can protect and improve your eyesight. Sunning and palming– these methods allow reactivation of your eye lens and ciliary muscles. Close your eyes and allow the sun shine directly on your face, and breathe deeply. Additionally, rub your palm together in order to generate heat and then cup your palms over your eyelids without any pressures and no trace of light, repeat this couple of times a day visualizing and try to imagine a pleasant scene. Ginkgo Biloba – has the ability to improve blood circulation and vision, protecting you against glaucoma, retinopathy, and macular degeneration. Moreover, it helps with anxiety, boosts memory and it is especially helpful with people who suffer from dementia and Alzheimer’s disease. You can take 120-mg og GB capsules a day in 2-3 divided doses. Note: children and people who suffer from diabetes are not allowed to consume it. Acupuncture/Acupressure – there are many acupressure/acupuncture points around the orbits of the eyes that can be massaged. Gently massage the points 5-10 seconds starting from point 1 massaging each distinct point. Repeat this several times a day. You should not massage areas with scars, or if you are pregnant. You can also walk in the morning on grass barefoot for 30 minutes as there are reflexology pressure points for the eyes on the 2nd and 3rd toe, and the green color has a soothing effect for the eyes. Eye exercises – are extremely beneficial because they make your eyes more flexible and will bring energy and blood flow and improve your focus. Do one of the following exercises every day for couple of months. You can hold a pen at an arm’s length and focus on it slowly bringing it closer to your nose and then move further until you can no longer keep it in focus (repeat this exercise 10 times a day); roll your eyes in the clockwise direction for couple of seconds and then on the counter side (repeat 4-5 times, blinking between each set); blink your eyes 20-30 times rabidly and repeatedly without squeezing them shut, then close your eyes and let them shut; concentrate your vision on a distant object 3-5 minutes a day. Fennel – it is rich in nutrients and antioxidants which have the ability to delay the progression of cataracts. Blend almonds, fennel and sugar candy (misri) or sugar and make a fine powder eating 1 tsp of it before going to bed after which you drink a glass of warm milk. Repeat this for 40 days. Almonds – they are loaded with omega -3 fatty acid, vitamin E and antioxidants, improve concentration and memory. Dip 5-10 almonds in water overnight, then peel them in the morning and grind them, consume it with a glass of warm milk. Do the procedure for couple of months. Wild asparagus – is extremely beneficial for your eyesight. Mix 1 tsp of it with half a tsp of honey and consume it 2 times a day with a cup of warm milk from cow for couple of months. Bilberry – it improves night vision, regenerates the visual purple component of the retina, protects against muscular degeneration, glaucoma, and cataracts, it is also good for retinal problems to diabetes or high blood pressure because it is high in anthocyanins. Eat half a cup of them a day; or bilberry supplements (160 mg). You should consult a doctor before. Indian Gooseberry (Amla) – it is loaded with vitamin C and other antioxidants which maintain the proper function of the retinal cells. Mix 2-4 tsp of the juice in half a cup of water and drink 2 times a day in the mornings and evenings, or you can consume it with honey. Healthy diet – eat foods that contain high levels of vitamins A, B-complex, C, E, Beta-carotene, amino acids, zeaxanthin, lutein, and chlorophyll. There are many vegetables that are rich in these nutrients, including beetroot, carrots, corn, broccoli, fish, eggs, spinach, nuts, sweet potato, and seeds. In addition, sitting in front of the TV, or PC for longer period of time is the worst enemy of your eyes. If your work is in front of a PC, distance yourselves 18-24 inches; get anti-glare screen; avoid reading in dim light; make sure you are not wearing glasses with wrong prescription; check your eyes regularly; get enough sleep; use quality eye cosmetics; wear sunglasses which protect you from the sun; and rest your eyes every 20 minutes.